Dhakai Paratha is a type of layered paratha which you can cook on tawa like paratha or fried like poori. You can serve this layered dhakai paratha with alu cholar dal (Bengali style) and any Bengali misthi such as sondesh or rasmalai. I adopt this recipe from Rimli blog “Scratching Canvas” . I’m biggest fan of rimli’s photography, she is completely mind-blowing photographer. I tried to adopt full technique of cooking dhakai paratha which was shared on Youtube by her. To prepare dhakai paratha, you have to prepare flour based dough and roll it into layered by greasing ghee or oil like North Indian style laccha paratha. As Rimli recommend, Never serve this dhakai paratha immediately after frying, try to serve after 15-20 minutes with Bengali alu based side dish. 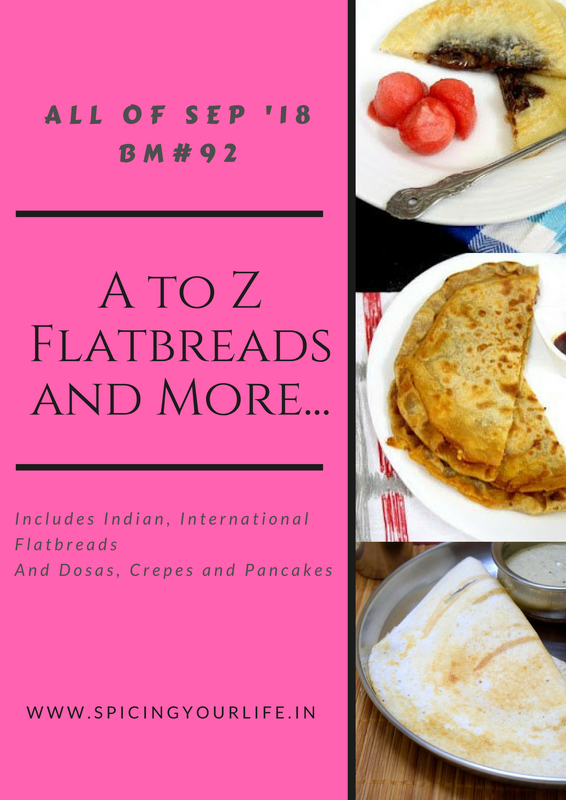 For 4th day BM#92 Indian flatbread AtoZ series my Letter is D, I choose Dhakai Paratha from West Bengal. If you like dhakai paratha recipe, then check other paratha recipe here: Banana Buns, Kootu ki Poori, Nagori, Sajja Boorelu and Tiranga Poori. Check other recipe with you can serve dhakai paratha: Paneer Butter Masala, Aloo Matar ki Sabzi, Matar Mushroom, Matar Makhana, Jeera Aloo, Paneer Pasanda, Dalma and more. Combine flour and oil in large bowl and rub with palms like crumbs. Now add water slowly slowly to knead the dough. Dough should not be sticky or dry. Cover and keep aside for 10-15 minutes to rest. Now divide the dough into equal portions. Take one portion and roll it using rolling pin and pour few drops of oil and spread evenly. Now sprinkle 1 tsp flour on the top of oil and spread again evenly. Take a knife and cut along the half center and roll it into cone shape. Now bind the loose end of corner inside of the cone. Cut it into half to remove pointed end and dip into oil and place on a separate plate. Cover and keep aside for 10 minutes more. Heat the oil in deep wok on medium flame. Now take a portion and roll it into round shpe using rolling pin and dust with little flour if needed. Add the one by one paratha in hot oil to deep frying till to puffed up like luchi or poori and slightly brown. Now serve this poori or paratha with any gravy or dal recipe. Dhakai Paratha is a layered paratha or poori which popular in west bengal and served with aloo cholar dal and sondesh. Combine flour and oil in large bowl and rub with palms like crumbs. Now add water slowly slowly to knead the dough. Dough should not be sticky or dry. Cover and keep aside for 10-15 minutes to rest. Now divide the dough into equal portions. Now sprinkle 1 tsp flour on the top of oil and spread again evenly. Take a knife and cut along the half center and roll it into cone shape. Now bind the loose end of corner inside of the cone. Cut it into half to remove pointed end and dip into oil and place on a separate plate. Cover and keep aside for 10 minutes more. Heat the oil in deep wok on medium flame. Now take a portion and roll it into round shape using rolling pin and dust with little flour if needed. Add the one by one paratha in hot oil to deep frying till to puffed up like luchi or poori and slightly brown. Now serve this poori or paratha with any gravy or dal recipe. Dhakai Paratha looks sinful , must be so crisp and yum . I have yet to try this paratha , though I have heard so much about it . That paratha looks so gorgeous! And the pictures have turned out so beautiful!! Simply amazing! Dhakai paratha rocks, such a wonderful Bengali deep fried paratha na, interesting to see this sort of dishes. All credits goes to BM na.. Well done Preeti. This is the first time I am hearing of this paratha. With all those layers, this must turn so rich and delicious. Wow! this looks so rich and I can imagine it must be very flaky. Superb choice for the letter. This one is new to me but looks very inviting Preeti.Nice pick for the alphabet! What a different recipe this is and love the layers in the paratha. Deep frying should have made it so rich and very flavorful. This must have tasted so good Preeti. We have a similar down in TN, where the parotta is deep fried too, poricha parotta, tastes out of the world!..such an excellent choice for the letter! Dhakai paratha seems to be so soft, love how the layers are made and then fried. Its something that I would love to try out soon, a lovely share for letter D.
A great recipe came to know Dhakai Paratha, Preeti, nice pick with the letter D.